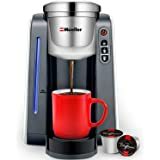 Experience the Revolution of Coffee. 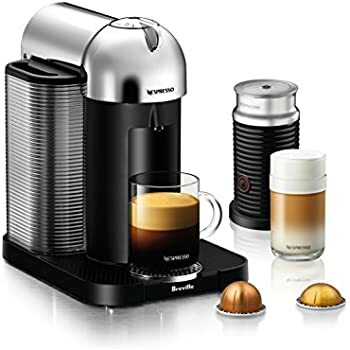 The new Nespresso VertuoLine coffee system provides coffee lovers with a revolutionary way to experience freshly brewed, large-cup coffee with an espresso style creme, as well as an authentic espresso at the touch of a button. Set includes the Nespresso Aeroccino Plus milk frother: rapid one touch preparation of hot or cold milk froth. 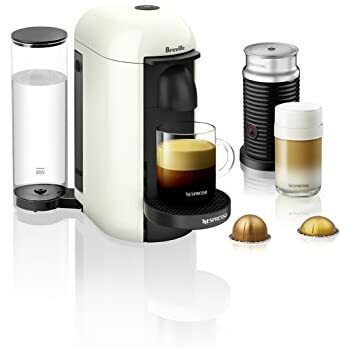 The new Nespresso VertuoLine revolutionizes the way that coffee is brewed, introducing Centrifusion technology to produce large-cup coffee with creme and espresso with the same high quality, in cup result. Centrifusion provides a system where extraction parameters are individually controlled and optimized for each Grand Cru coffee. 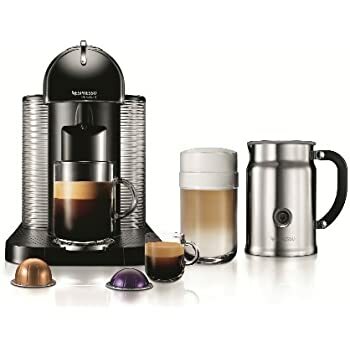 Over 25 years ago Nespresso pioneered the portioned coffee system and has been continuously innovating ever since to deliver the highest quality coffee experiences to consumers worldwide. 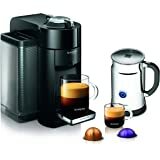 Nespresso is once again revolutionizing the world of coffee by launching a new system; the Nespresso VertuoLine. 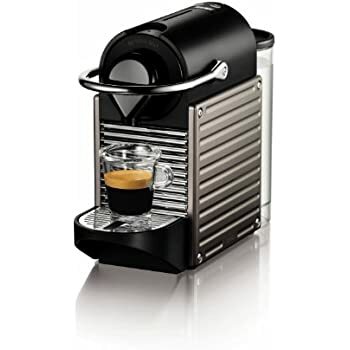 To obtain the perfect coffee or espresso, Nespresso experts seek out only the ﬁnest Grand's Crus green coffees, which promise to offer the most tantalizing aromas. The virtuoso 'alchemists' compose the blend from these diverse origins and decide upon a speciﬁc roasting and grinding proﬁle. 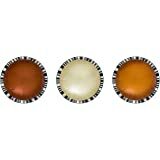 Each Nespresso Grand Cru has a distinctive character. 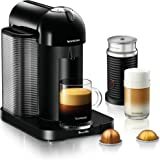 You can, depending on the variety of different recipes, enjoy Nespresso with milk. When combined with creamy milk foam, you will experience a whole new variety of flavors. The Nespresso Club Services. A world of services at your disposal. 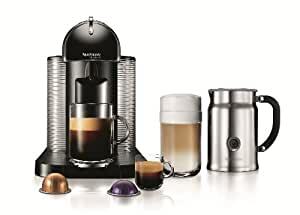 The Nespresso Club is always there for you, online, by telephone or in one of our Boutiques. Order your Nespresso capsules, receive personalized advice and obtain technical support for your machine: whatever you are seeking, the Nespresso Club and its Specialists are with you every step of the way. Benefit from quick & easy ordering whenever, wherever. 5.0 out of 5 starsAwesome. 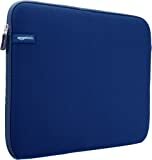 I have used this machine for about a week, and it is awesome! 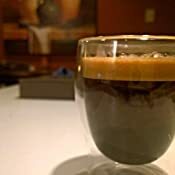 I had used an espresso machine frequently years ago, but got sick of the grinding, prepping, priming, etc., especially before work in the morning. 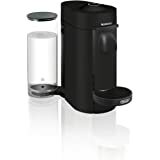 So, I eventually gave up and bought a plain-ole coffee maker. Unfortunately, "regular" coffee, to me, tastes like hot water. I even tried a Kuerig, but returned it within a month - it was more convenient, but the coffees are no higher quality than any grocery-store brand coffee. 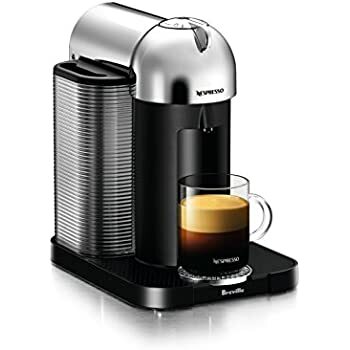 So I debated for a long time about whether I should wait for one of these brand-new Nespresso Vertuoline machines, or just buy one of the older, espresso-only Nespresso machines. I have to say that I'm very happy that I waited for this one! 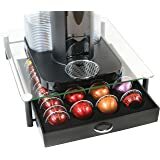 The espresso is excellent, the drinks have all been hot (even when adding milk from the Aeroccino), the whole spinning process takes about 15 seconds (or less) to pour into the cup, and - most surprisingly - the new coffee-sized cartridges are AWESOME! They taste NOTHING like regular, ground grocery-store coffee-in-a-can. They are much more flavorful, much stronger, and seem fresher even than using whole coffee with a grinder (maybe it's from being sealed in the aluminum cartridges?). 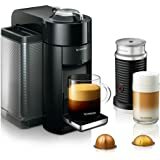 The Nespresso club has been great - they ship coffee and espresso cartridges within two days, and seem to have excellent customer service. I emailed a question to them and had a personal answer (not a canned answer) within about 3 hours. 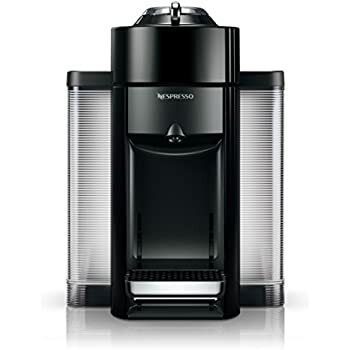 My final comment - I have tried Keurig coffee in the past, and now have this Vertuoline; the Keurig wins on availability, but if you want a single-serve coffee maker, and actually appreciate and LIKE THE TASTE of good coffee, then this machine wins HANDS DOWN. 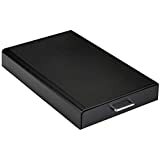 EDIT 3/4/2014: Just wanted to add, based on another reviewer's inaccurate comments, that you CAN adjust the volume of the pour to between 0.3oz. and 17oz. by a simple process that is clearly explained in the owner's manual. 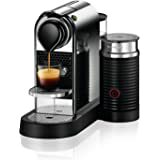 The machine remembers your programmed espresso levels and coffee levels separately, and keeps that programming until you reset it. 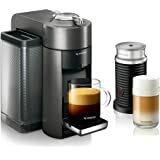 I love my morning or late afternoon cappuccinos and lattes, but the amount of money I was spending on Starbucks was getting a bit ridiculous ($4 lattes x 365, you get the idea), so I decided it was time to invest in a machine of my own. 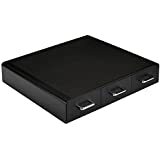 I spent a couple days going through several reviews of many different systems, ranging in price from about 200-500$. The main issue that came up on almost every machine was the milk frothers/ heaters. 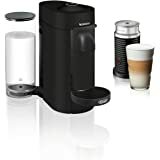 Just about every machine had great reviews but had a handful of reviews from customers complaining about having to send back their machines to get the milk frothing systems fixed or replaced, and being without their morning coffee for a while. So this machine seemed like the most reasonable choice. I also bought the Epica milk frother since it had better reviews than the Nespresso version. I keep the Nepresso frother stored in case the Epica breaks. 5.0 out of 5 starsNot your average coffee!!!! I purchased this machine about a month ago. I was somewhat skeptical because it is a pod machine. 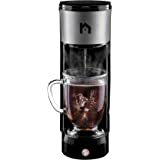 I am a big fan of fresh roasted and ground coffee in a french press and couldn't really imagine that any prepackaged coffee would be worth drinking. We have a small Kuerig that we use for quick morning coffee and it's just "OK" coffee. This is something completely different. 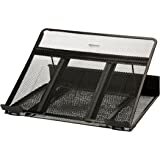 First: The machine itself is extremely well-built, the packaging felt very high-end. The lines are beautiful and it doesn't take up a lot of space. The reservoir is a nice size and having a used capsule container attached helps keep things tidy. The included milk frother is just as beautiful and possibly the best coffee accessory I've seen. Second: The coffee. Just wow. In addition to the idea of prepackaged coffee, I was a little hesitant because of the price of the capsules. At $1.10 a cup, I thought it was a little expensive. 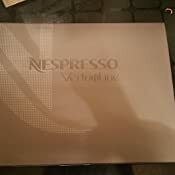 When you buy through the www.nespresso.com/virtuoline website, you have to buy at least 50 capsules, making it an almost major purchase to buy coffee. But here's the thing: This coffee is beyond amazing. Each cup is flawless, with a thick rich crema and perfectly balanced coffee, regardless of blend. Definitely worth the price. This machine works ok except that the coffee is NEVER hot enough. Another problem is the pods. 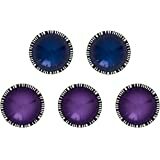 The cost is very high and they are hard to find. For two cups of coffee per day, it costs about $60.00 per month. 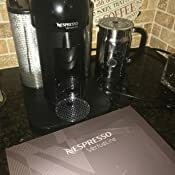 We retired this machine and went to the Ninja Coffee machine where you grind your own coffee at a fraction of the price, it is very hot, and bought another frother as the Nespresso one we had bought broke. What breaks in these is the little plastic wheel the turns the whisker. The price is a bit lower now on this machine but the real price is the coffee. This is a great combination for making good espresso. 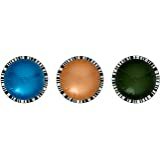 I have so far used three varieties of coffee (Odacio, Carmelito, Stormio) and Diavolito espresso. All are quite robust in flavor. 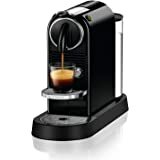 The crema the machine makes is excellent, I have not been able to make espresso that good on my DeLonghi machine. The Aerocino frother does a very good job creating very frothy milk. 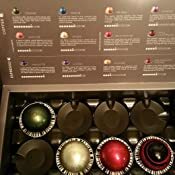 On the downside: Right now Nespresso has a lock on the capsules so the price remains $1.10 for the coffee, and .85 for the espresso. I have purchased a reusable capsule but haven't tried. Still, compared to a $6.00 latte @ Starbucks, and for better flavor, Nespresso is a good deal. My other complaint is the Aerocino frother... It does not make the milk "extra hot" -- only comes in one temperature... So you have to be okay with that.